Most of the time, squirrels are completely benign, but in some situations, they can cause considerable damage. If you want to put an end to your squirrel problem, don't miss our five-point action plan. Don’t let the bushy tails fool you. They may be cute and and bright-eyed, but if left unchecked, squirrels can do an impressive amount of damage, not only to your garden, but also to your home (particularly the attic and eaves). While there’s no quick and easy way to get rid of squirrels, you can do a number of things to slowly shoo away these mischievous creatures. 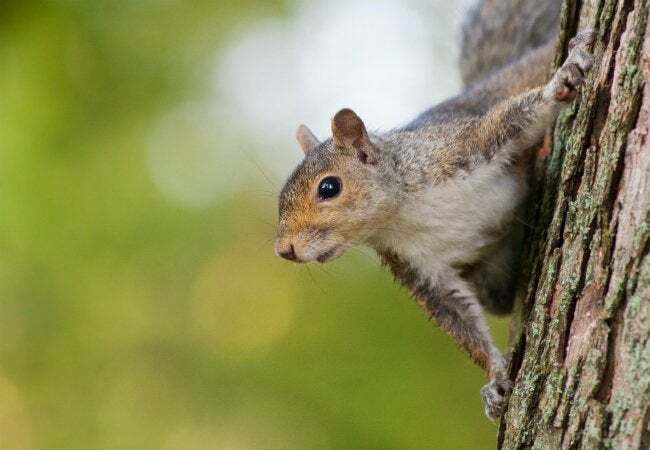 Whether you’re responding to an existing squirrel problem or seeking to prevent one, read on for a five-step action plan. If the neighborhood squirrels seem to be more interested in your house than in the one next door, it only makes sense to investigate the reason why. First things first, scan your property for an obvious food source, such as a bird feeder. Even if mounted on a tree or atop a pole, bird feeders are well within reach of squirrels, agile animals capable of jumping eight to ten feet with relative ease. If not going to go great heights in search of food, squirrels are just as likely to dig for it. Garden bulbs, in particular, are vulnerable. In lieu of protecting your flower beds with chicken wire, consider planting strategically placed daffodils. Since these perennials are poisonous to squirrels, they act as effective deterrents. 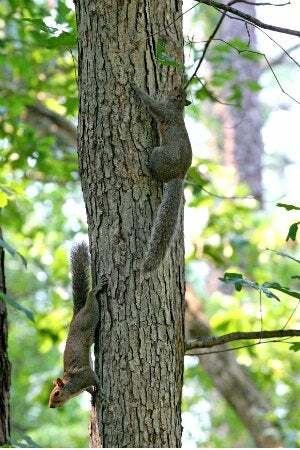 Everyone knows that squirrels are expert climbers. What you may not have realized is that, by banding tree trunks with plastic or metal collars (sometimes known as baffles), you can prevent squirrels from progressing along those routes that afford access to vulnerable areas, such as the overhang of your roof. To augment your other efforts, hang ammonia-soaked rags on the branches squirrels seem to favor. Doing so has proven moderately successful for Lindsay Wildlife Museum in Walnut Creek, CA. Alternatively, you can purchase and spread predator urine, available for sale at garden supply stores or home centers. The downside is that such treatments must be reapplied after every rainfall. There are many chemical repellents on the market that work well to get rid of squirrels. Look for products containing the active ingredient capsaicin. While some homeowners choose to spray repellent near entry points to the attic, others go a step further and apply it directly to bulbs before planting. A last option—perhaps a futile one—is the use of live-catch traps. Even when baiting the trap with a squirrel favorite like peanuts, expect to wait a few days for the trap to become a familiar part of the environment, something the squirrels feel comfortable investigating. Once that introductory period has passed, be sure to check the trap twice daily. If you trap a squirrel, act quickly to relocate it from your property to a suitable location at least three miles away, preferably across a major highway or large body of water. Before doing anything else, the wise course is to check in with your local fish and game department, since various municipal and/or state laws may govern the treatment of squirrels where you live. In California, for example, it’s illegal to trap gray squirrels without a permit. Note that some of the heaviest regulations pertain to the use of rodenticides. For that reason alone, putting aside all ethical questions, it’s recommended that you rely solely on nontoxic control methods.